NOTE: Information good as off 5/25/2015 and is subject to change! 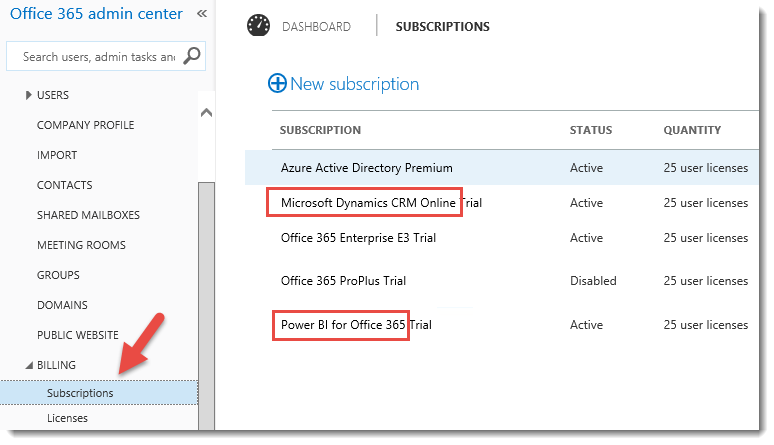 This issue came across when a customer was trying to sign up for the Dynamics CRM Sales Productivity Suite, and saw that Power BI for Office 365 was not added as part of it. The actual package shows that Power BI can be tacked on at a discount. When everything is signed up, we should see something similar to the following (minus the Trial pieces), under the Billing/Subscriptions area. 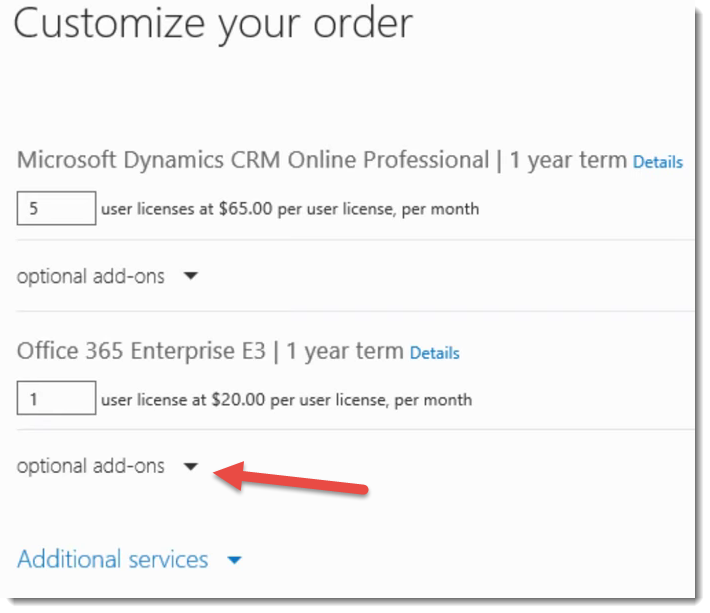 The customer in this case did not see the Power BI for Office 365 subscription present and was inquiring as to why that was the case. What happened to Power BI? The main Dynamics landing page has the link to the CRM Sales Productivity Suite. If you scroll down about half way, you will see a button/link for Get started with sales productivity. 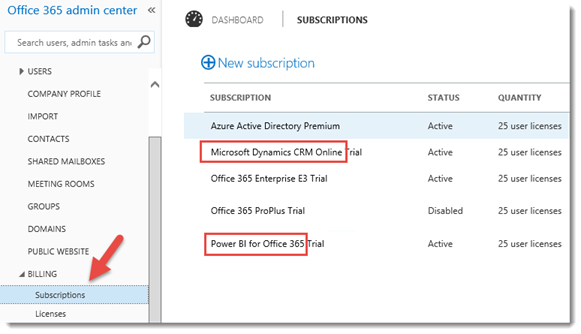 You can also see that it shows Dynamics CRM + Office 365 + Power BI. Clicking on the button brings you to a selection to pick from. The Sales Productivity is the middle one. There is a description underneath that, if not read carefully, causes the problem. You can easily blow right past it and lead into this situation. I would almost liken this to something like the Eula. If someone believes they know what they want, they just click the buy button and don’t read the fine print. 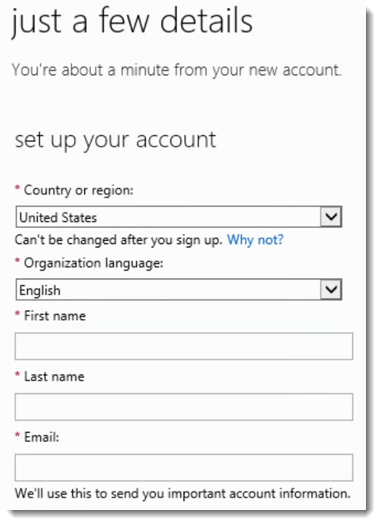 Step 2 is a little important if you are wanting the Power BI piece of this. When we click on Buy, we have to enter in our account information. 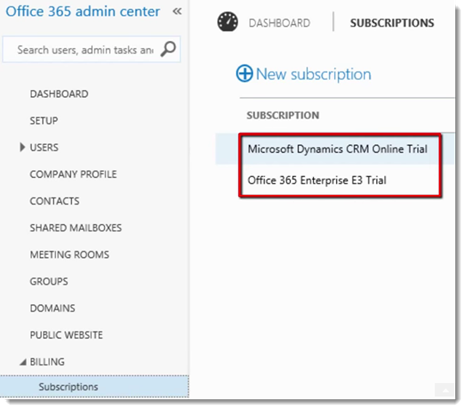 This will create the actual O365 Tenant for you. When done with that, you can hit Continue at the bottom. You will then see a Customize your order page. This is where you need to pay attention! And, why this is so easy to miss. 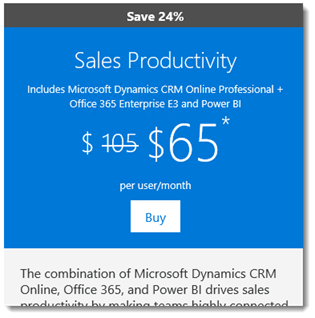 By default all you are seeing here is Dynamics CRM and Office 365 E3. There is no Power BI in this list. 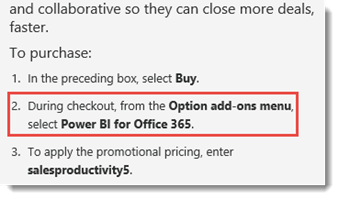 What step two of those instructions is telling you, is to select Power BI for Office 365 under optional add-ons menu. You have to expand it to see it. It isn’t in your face. 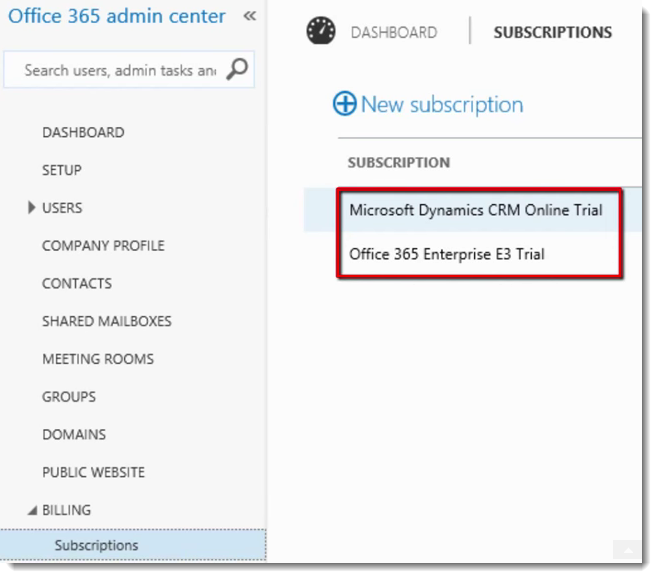 When you do this, you will see Power BI for Office 365 Add-On. You will want to add some licenses to this so it is included in your purchase. The shopping card will update, and you can check out (don’t forget the offer code that was listed in the instructions). That is how you include Power BI with this offering. What do we do if we messed up? How do we add Power BI? Ok, so we messed up. How do we correct it? 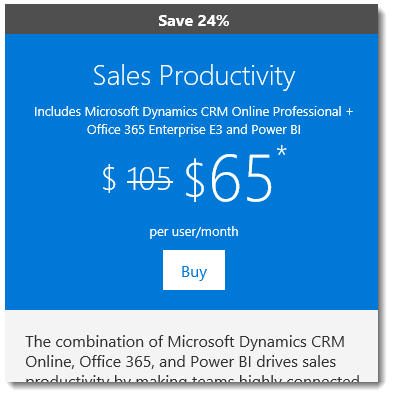 I want to get Power BI for Office 365 added with the package discount. 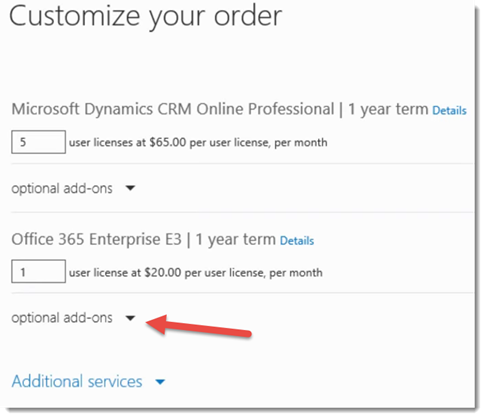 I talked to the O365 Commerce team, and unfortunately there isn’t anything we can do for the existing tenant that will get us the discount. 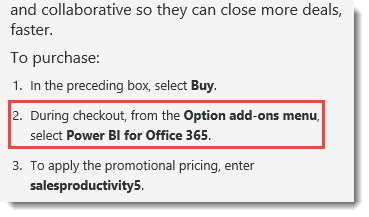 You can always just add Power BI for Office 365 onto the tenant that was created, but it won’t be at the discounted price. 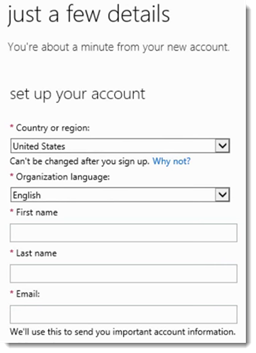 The O365 Commerce Team indicated that you would need to go through the process correctly, creating a new tenant, and making the proper selections. While it is not a great option, it is probably the best option that is actually available.